Available on iTunes, Google Play and Spotify. 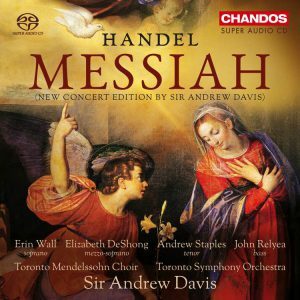 Andrew Fletcher, writing in NE:MM.org in the UK, says: “Sir Andrew Davis claims that for this new concert edition, he wanted to do a ‘grand’ version, and sought to “keep Handel’s notes, harmonies and style intact, but to make use of all the colours available from the modern symphony orchestra”. Read the full review on NE:MM.org. Leslie Barcza, writing on barczablog, says: “Davis’s orchestration is like a witty commentary upon Handel, a gloss, a self-aware adaptation that sometimes positions itself in the tradition of Beecham’s big muscular sound with brass and percussion to underline key climaxes & phrases.” Read the full review on barczablog. David Olds, writing in The Wholenote, says: “this new recording does the Toronto Symphony Orchestra, Toronto Mendelssohn Choir and, indeed, Toronto itself proud.” Read the full review. Brad Wheeler writing in The Globe and Mail says: “Upon its premiere in 2010, Sir Andrew Davis’s reimagined Messiah, as presented by the Toronto Symphony Orchestra, was described by The Globe and Mail as a “toe-tapping modern take on a hallowed masterpiece” and a “keeper.” Six years later, just in time for Christmas, the TSO take on Handel’s holiday crowd-pleaser is absolutely a keeper, in the take-home form of a two-CD box set released on the British label Chandos.” Read the full review. 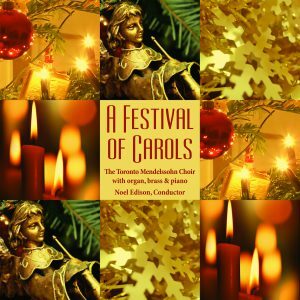 ” …a wonderful selection of 20 well-known Christmas carols in a variety of excellent arrangements. 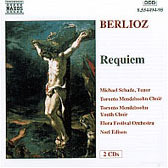 This CD is available from the TMC office. If you would like to see the TMC performing, you can enjoy a number of video clips on the TMC YouTube Channel. You can watch some full performances on the TMC webcast channel on Livestream.